ARID Ice introduced the new MS 2600 Desiccant Dehumidifier. The MS 2600 is designed for the smaller recreational, practice and curling rinks. This system is designed to mimic the physical and power consumption profiles of typical mechanical refrigeration dehumidifiers, making it an excellent replacement system. The MS 2600 provides considerably more drying capacity with minimal retrofit cost. 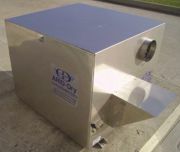 The MS 2600 is designed to deliver 2600 scfm of dry air and runs on less than 20 amps of electricity at 480 volts. Its deep grain depression makes it the best choice for moisture control in ice surface venues. The Munters FreeDry and IceAire Heat Pump system uses waste heat from the existing refrigeration plant to reactivate the desiccant wheel instead of natural gas. Arenas can save thousands of dollars per month by eliminating their gas bill. This advanced technology is capable of offering low dew-point air—providing arenas an efficient method for reducing humidity. Applicable as new or replacement systems. Sport Resource Group announced the offering of custom colors for its ProWall product line. Just recently, Sport Resource Group manufactured custom color rinks for customers featuring yellow, blue, green, tan and light gray panels. In addition to these colors, brown, olive and charcoal gray are also available, as well as ProWall's original natural color. ProWall is a rotationally molded plastic dasherboard system for hockey, lacrosse, soccer, football and other enclosed activities. ProWall can be designed for permanent or portable applications and can host a variety of upper containment options, such as acrylic, mesh netting or chain-link fencing. From the pros to the pee-wees, Crystaplex® ice hockey and inline dasherboard systems give you more. More lasting value. More safety options. More design innovation. More consistent performance. More professional service. More quality in every rink system manufactured and installed. With four decades of experience building and installing dasherboard systems for the NHL and communities worldwide, Crystaplex® is the benchmark for quality and innovation. Pictured here, the Breck School Anderson Arena in Golden Valley, Minn., features the CheckFlexTM Gold dasher board system, full seamless glass, monofilament netting and backer panels. Wondering what to do with your empty winter space? Turn it into a fun outdoor skating place, with an outdoor NiceRink. Long-lasting plastic sideboards, patented support brackets, hand resurfacers, liners and more. Free information, costs and how-to are available. Outdoor Ice Rink offers peace of mind. Sports Systems Unlimited, the company known for The World's Best Hockey BoardsTM , presents the Maximizer Rink Divider. The Maximizer allows multiple groups to share ice at the same time, increasing your rental income. Maximizer Rink Divider comes with nine straight panels, plus four radiused panels where divider meets boards for outstanding playability. It takes just minutes to set up and comes with a specially designed storage cart for easy handling and storage. The solid 3-inch tubular aluminum frame construction comes with a two-year warranty. Pawling's Interlok tiles are manufactured using a proprietary virgin rubber compound unique to the industry that provides outstanding performance and exceptional design flexibility. The unique Interlok system provides secure, trip-free flooring without the costly installation of glue-down rubber floors. Pawling's Pro-Tek premium flooring compound is formulated to provide the superior performance that recycled rubber flooring cannot match, while still offering a variety of colors to create the look and feel you want. Covermaster's Terracover Ice® is the ideal ice conversion cover because it was specifically designed for that purpose. It is light in weight and installs quickly without any specialized equipment. The cover is supplied in 6-foot, 7-inch square panels that interlock with simple camlocks. Because Terracover Ice® has a high insulation factor, the ice remains fully intact. Made of high-density polyethylene, it can easily withstand the weight of loaded forklifts. Last but not least, the system looks good and cleans up quickly.